Federal finance minister Bill Morneau outlines the Liberal’s new tax strategy during a briefing in Ottawa on December 7th, 2015. 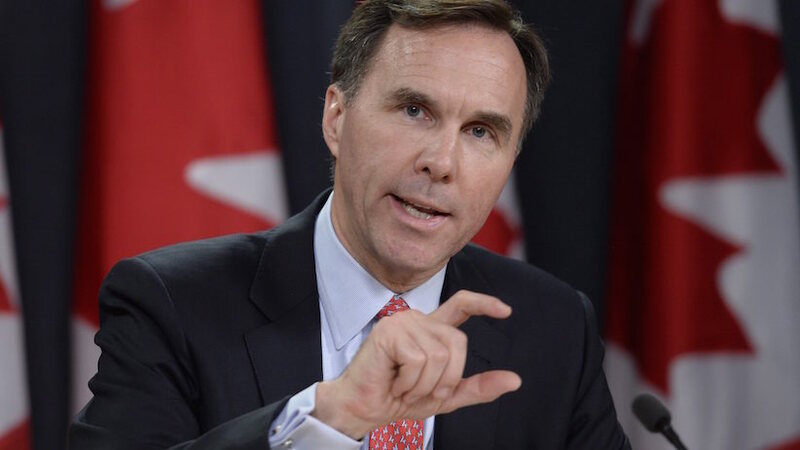 As outlined in the December 7th, 2015 MacLeans post, "Bill Morneau on tax cuts and fiscal realities," the current Liberal government has promised to balance the Federal budget in 2019. Photo c/o Canadian Press/ Adrian Wyld. New federal tax legislation, currently aimed at closing loopholes exploited by the richest Canadians could end up penalizing the small- and medium-sized business (SMB) owners and entrepreneurs who serve as the backbone of Canada’s innovation economy. At least that's the story outlined in the August 30th, 2017 IT Business post, "New tax legislation would penalize entrepreneurs, stifle innovation, CATA says." The article quoted Paul Labarge, a member of the Canadian Advanced Technology Alliance (CATA) Innovation Leadership Council and co-founder and partner of Ottawa law firm Labarge Weinstein, as stating that the changes "would functionally see the CRA treating entrepreneur and employee earnings exactly the same way every tax season, with no accounting for either the increased risk experienced by business owners, or the greater resources enjoyed by enterprise and government employees." As announced in July, 2016 by Federal finance minister Bill Morneau (with feedback expected on October 2nd), the proposed tax code changes have been framed by the Liberal government as a simple amendment to existing rules to prevent the richest Canadians from “unfairly exploiting” rules designed to help businesses grow and ensure that people of similar income levels pay similar amounts of taxes. It's an interesting debate just so long as we remember that taxes and tax "loopholes" almost always effect small business more than large, multinational corporations or the very rich, no matter what the experts might think. It's also a useful reminder that private efforts, not multi-year centralized, externally imposed long-term business plans, are the real innovation drivers in Canada. Graham Gibbs. Photo c/o My Canada. Our space industry and Federal government should take note. Of course, not every public policy maker is willing to dismiss the subtle esteem and influence they inherit through their position. 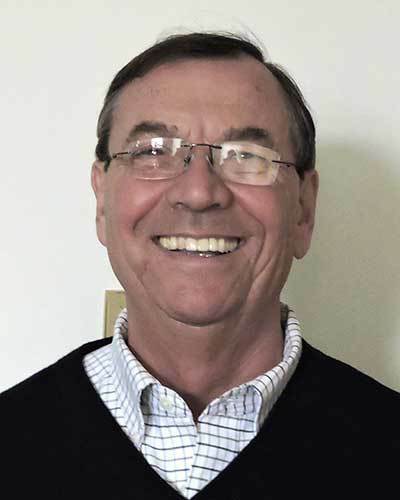 An example of this would be Canada's recently retired space agency representative in Washington DC, Graham Gibbs who, as outlined in the September 7th, 2017 SpaceQ post, "Rationale and Framework for a Canadian National Space Policy," has taken it upon himself to critique the August 2017 Space Advisory Board (SAB) report "Consultations on Canada’s Future in Space: What We Heard." That report, as outlined in the August 25th, 2017 post, "Space Advisory Board Report: "Sound and Fury, Signifying Nothing" Except that Board Members Want to Keep their Jobs'," was mostly about SAB members coming clean and admitting they weren't done yet, but wanted a chance to complete their report and retain their positions. But Gibbs, while mostly focused on what to clarify and who to include when writing the final report, also noted some useful and until now mostly unacknowledged context. Chief is the fact that the SAB had been tasked only to "inform a national space policy" which is all about offering suggestions regarding procedures and generating public support for existing policies; but doesn't include defining or creating any new ones. Unfortunately, the development of new policies was kinda what most of the participants were really looking for. 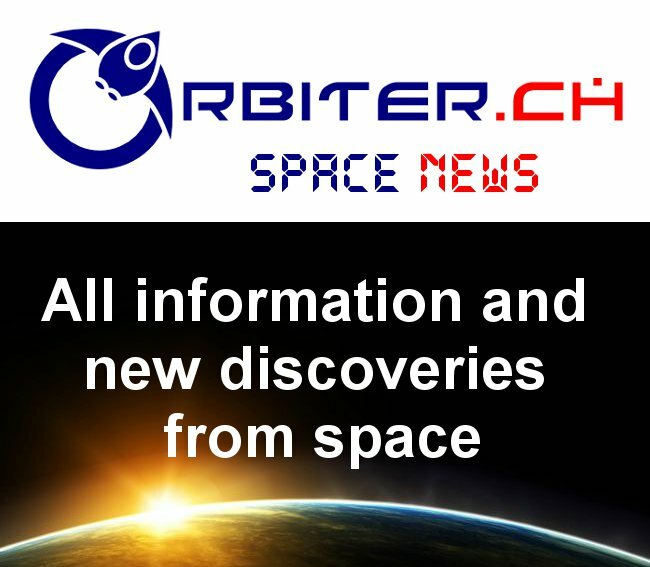 However, and as mentioned in this blog numerous times in the past, "space policies" are highly political discussions which often demand new ideas, new funding and additional incentives to bring aboard longstanding government stakeholders and/or contractors. Our current domestic space industry, hasn't really ever been able to lead the government towards crafting one, although there have been several recent attempts. A scanned copy of the lower section of page three of the September 13th, 2015 Toronto Star. 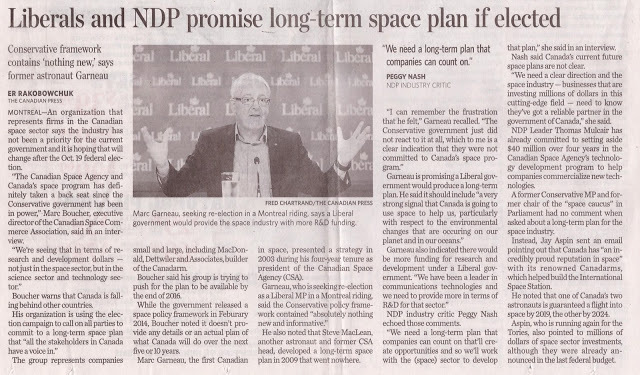 As outlined in the article, both the federal NDP and the federal Liberal party committed to developing a long-term space plan (LTSP) during the October 2015 Federal election. As reported in the January 19th, 2013 post, "Praising Steve MacLean," the last LTSP, developed in secrecy by then CSA president Steve MacLean in 2009, was rejected by the federal government because of its high cost, and finally superseded by the David Emerson led aerospace review in 2012. LTSP's Scan c/o the Toronto Star. Most notable were the 2012 David Emerson led Aerospace Review and the 2015 election promises from both the Federal Liberal and NDP parties to craft a new "long-term space plan" if elected. Initially, the new SAB, announced in spring 2016, was considered to be the Liberal fulfillment of this political promise. Now its not, although Gibbs is perhaps the first to acknowledge this publicly. Gibbs also noted that the last Federal government space policy document was a 1974 document issued by the then Ministry of State for Science and Technology (MOSST). All the rest, including the various long-term space plans (but with the notable exception of the 2012 David Emerson led Aerospace Review, which he called "a good start") were simply documents designed to "inform" but not alter. Now that the most current SAB report has been publicly denounced as being as dead as the parrot in the Python sketch, the stage is now set for SAB conclusions to be disavowed by the Federal government, no matter what they might eventually end up looking like. And now we also know why the original SAB, as announced in the November 19th, 2014 post, "Industry Minister Moore Announces Space Advisory Board Members," never published a final report. They were just too smart. A cluster of three two-chamber RD-250 (8D518) engines formed a six-chamber RD-251 (8D723) propulsion system of the R-36 rocket. Image c/o RussianSpaceWeb. Speaking of smart asses, a well respected journalist focused on Russian space activities doesn't think the Yuzhnoye Design Bureau is capable of building any complete models of the Cyclone 4M rockets which it has promised to beginning launching out of Canso, Nova Scotia, starting in 2018. As outlined in the September 5th, 2017 Russian Space Web post, "The RD-250 engine at the center of an international storm," journalist Anatoly Zak, as part of a larger article on the history of the Soviet era rocket engines and their modern day derivatives, has concluded that there are multiple components on various models of the rocket, which are only available through Russia. The newly proposed Tsyklon-4M aimed to fly from a new spaceport of Canso in Canada, would rely on a newly developed Ukrainian engine — the RD-870 — burning non-toxic cryogenic oxidizer (which also makes the engine largely useless for military purposes). 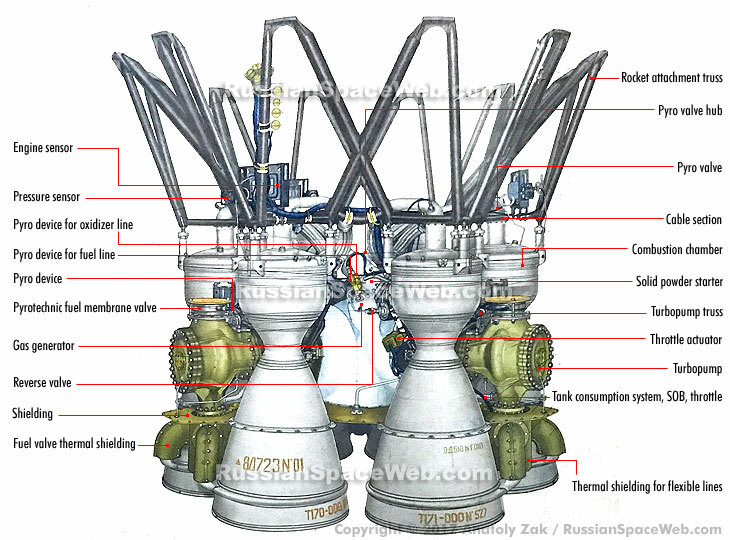 The RD-870 will employ all the key components of the Soviet-era RD-120 engine (the genesis of most current Yuzhnoye rocket designs, including the Tsyklon-4 and its Canadian derivative, the Tsyklon/Cyclone-4M), which was also mass-produced in Ukraine, for the exception of its combustion chamber made in Russia. Even with available combustion chambers, Ukrainian engineers are still facing an uphill battle in manufacturing the RD-870, especially after a complete breakdown of cooperation with Moscow during the Crimean crisis in 2014. Without a supply of key construction materials from Russia, the RD-870 program has huge challenges to transition from paper to metal and the problem has remained unresolved until now. Anatoly Zak. Photo c/o RussianSpaceWeb. The article also noted that the development of the Tsyklon/Cyclone-4M rocket and its supporting facilities has turned out to be a substantially more intensive program than originally anticipated. According to the article, "the Tsyklon-4M program would be the first significant step in the process of building a fully Ukrainian space launcher, resembling the Russian effort in the 1990s to develop the Soyuz-2 launch vehicle." The total price tag for the fruitless Tsyklon-4 (Ukrainian Brazilian) project was estimated at more than $900Mln US, with as much as $400Mln US spent by Ukraine. As first reported in the September 11th, 2016 post, "Ukranian Based Yuzhnoye Design Office Eyeing a Canadian Spaceport for its Cyclone-4 Rocket," Yuzhnoye has been authorized by the State Space Agency of Ukraine (SSAU) to establish a launch base for its Cyclone-4M rocket in North America. Early this year, the company pledged to set up a Canadian launch facility in Nova Scotia. For more, check out upcoming stories in the Commercial Space blog.